Police report multiple incidents in Israeli Arab towns following local elections, including rioting, torching of cars. Riots broke out in a number of Israeli Arab towns overnight after voting closed and the preliminary results were released for Tuesday’s local elections. Voters across Israel cast their ballots in mayoral and local council elections, with roughly 57% turnout, a major increase over the 43% turnout in the 2013 municipal elections. According to an Israel Police spokesman Wednesday morning, rioting broke out in a number of Israeli Arab towns across northern Israel overnight, following the release of the preliminary results of the election. 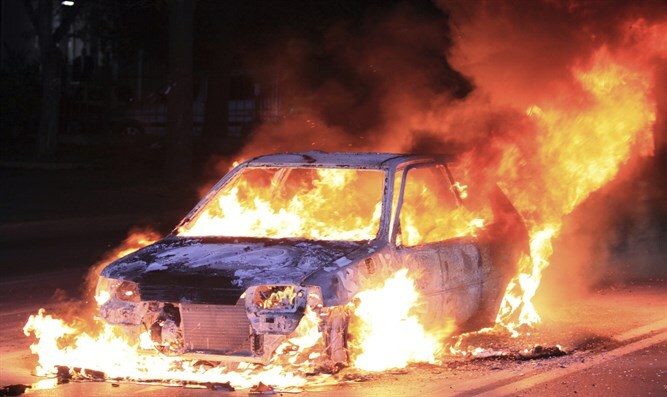 In a number of towns, rioters torched cars and vandalized local businesses. At least five people were arrested in connection with the riots. Officers were deployed to break up the illegal gatherings and restore order. In town of Turan in the Galilee, northeast of Nazareth and west of Tiberias, police reported that a vehicle was set on fire during post-election disturbances. In the Lower Galilee town of Kafr Manda, rioters torched at least one vehicle and attacked local businesses, damaging several of them. Police arrested one rioter. Rioters in Sakhnin vandalized a number of businesses before police moved in to reestablish order. Outside of Nazareth in the town of Iksal, police took four suspects into custody after rioting broke out overnight. Gunfire was reported in the village of Tuba-Zangariyye near Tzfat [Safed], and in a separate incident, several vehicles were vandalized. Police have opened an investigation into the disturbances in Tuba-Zangariyye.